Maria Aponte was born and raised an only child in East Harlem, otherwise known as “El Barrio,” in New York City, to Puerto Rican parents. Because she lost her mother at 16, and her father at 22, loneliness was a battle she fought most of her life, but it was also what made her the undefeated warrior and artist that she is today. And perhaps, the eternal yearning for parental guidance and wisdom, is what drove her to create a non-profit which honors elders later in life. At 60, Aponte has achieved much. She has written and performed two one-woman plays, the autobiographical “Lagrimas de mis Madres,” and “I Will Not Be Silenced,” based on the life of Sor Juana Ines de la Cruz. She has also written a poetry book, and a memoir, “The Gift of Loss,” which most recently hit shelves. In addition to working full-time in career development at Fordham University, she also started a non-profit called Latina 50 Plus four years ago, through which she honors other Latina pioneers over the age of 50. “I got the opportunity to tell my story in “Lagrimas de mis madres,” says Aponte about the play based on the women in her family, which she wrote during her undergrad years. She says the story came easily, because she wrote the script using the poetry she had written throughout her youth. 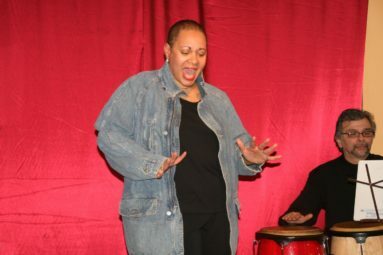 Because she was not the “typical looking Puerto Rican actress” of the time, she explains, like Rita Moreno – but more Afro-Latina in appearance, Aponte says she found she would get more work if she wrote plays herself. Her next play about Sor Juana de la Cruz, she also developed into a one-woman show and took it on tour around the country. She says she knew she was born to be an artist as young as age 7. She adds that her favorite medium will always be theater. She says she also learned a lot from the late Miriam Colon who was the founder and director of NYC’s Puerto Rican Traveling Theater. “My elders taught me about my history and my culture,” says Aponte, who moved to the Bronx in the 1980’s, where she still resides today with her husband and fellow storyteller, Bobby Gonzalez. Now that she’s older, she would like to return the same favor and be an example for the youth she encounters. 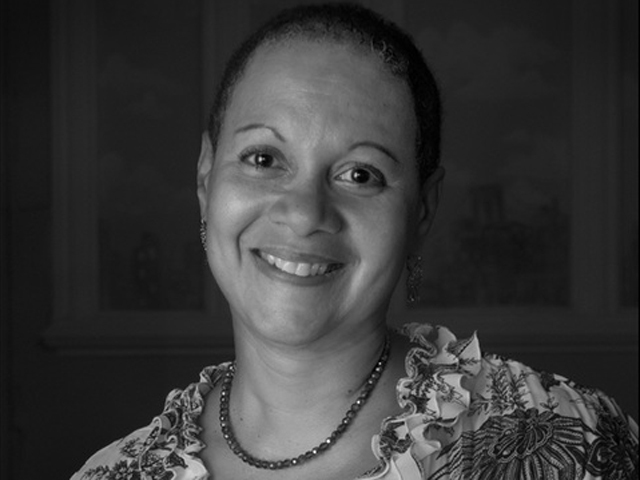 Aponte has led a structured presence, in her otherwise diversified creative life, working full-time at Fordham University for the past 19 years. She has spent time in various departments, but has stayed in career services for the past 11 years – in the managing diversity initiative, and in 2014 she simultaneously completed her MA in Latino Studies. For herself, she realized how life growth happens in stages, over time, and she tries to teach that to others. Through her writing, Aponte says she has documented the amount of years it took her to become her own woman. She adds that most people don’t want to deal with emotion, but everyone has to at their own timing. Why she created Latina 50 Plus? Latina 50 Plus is a non-profit currently in its fourth year. The fourth annual luncheon, taking place on June, 24, will be honoring seven women in the fields of art, community service, education, medicine, law and literature. The next goal, she says, is a mentoring program. Her advice to her younger self?